Back in the early 1900s there were virtually no regulations on the ability of people to sell drugs to their fellow citizens. This was the age of “snake oil” and patent medicines, none of which required testing to show that they were actually safe or effective. There were thousands of purveyors of various nostrums, many of which purported to treat or cure any number of diseases. Many of these peddled preparations did double duty: they could be administered to either man or beast. Scientifically, there was almost no understanding of how drugs might function mechanistically. It would have been hard for drug companies to become big firms back then. What would enable them to distinguish themselves from their competitors? Of America’s 50 largest companies in 1917, not a single one sold drugs. There were only a few effective medicines in that era. Drug companies arose out of two disparate businesses: apothecaries, which sold plant-derived medicines, and from the German chemical dye industry. Among the earliest plant derived drugs were morphine and quinine; some of the first chemically produced drugs were the barbiturates and arsenicals such as Salvarsan (used to treat syphilis). Vaccines were available to prevent smallpox, rabies, and diphtheria, but not many other diseases. Despite the passage of the Federal Food and Drug Act in 1906, adulterated and dangerous drugs and treatments were still widely available for decades. Potions and treatments offered were more likely to kill you then make you better. In 1932 The Wall Street Journal published an article entitled “The Radium Water Worked Fine Until His Jaw Came Off.” It detailed the sad case of Eben Byers, a wealthy American socialite and athlete who died in 1932 of multiple cancers after consuming Radithor, a patent medicine. It was peddled by a Harvard dropout who falsely claimed to be a doctor and who offered physicians a rebate for selling his lethal concoction. Byers was so radioactive when he died that he had to be buried in a lead lined coffin. Charlatans ran roughshod over the citizenry selling their worthless treatments (and yes, it still happens today). Another notorious episode revolved around John Brinkley, who offered up a procedure in which he would implant minced goat testicles into men to restore lost “vitality”. It was the Viagra of its day. He developed a huge following until losing a famous libel trial against Morris Fishbein, head of the American Medical Association. The jury stated that Brinkley "should be considered a charlatan and a quack in the ordinary, well-understood meaning of those words." The story is fascinatingly recounted in Pope Brock’s expose´ Charlatan: America’s Most Dangerous Huckster, the Man Who Pursued Him, and the Age of Flimflam as well as the 2016 documentary Nuts! A law requiring that drugs be tested for safety was finally enacted in 1938 with the passage of the Federal Food, Drug, and Cosmetic Act. The legislation was passed in response to the Elixir of Sulfanilamide disaster. More than 100 people (mostly children) were fatally poisoned by consuming a drug in which the flavoring agent had been dissolved in diethylene glycol (a poisonous compound related to anti-freeze). There were no requirements at the time that companies do safety tests before marketing their medicines. I recommend Barbara Martin’s extraordinarily detailed account of this sad chapter in American medical history, Elixir: The American Tragedy of a Deadly Drug. Sadly, the company was only required to pay a small fine because under the laws at the time, agents labeled as elixirs were required to contain alcohol, and this one did not. The chemist who prepared this toxic elixir eventually committed suicide. The legislation most responsible for the tremendous growth of the pharmaceutical industry was enacted in 1962 with the passage of the Kefauver Harris Amendment to the 1938 Federal Food, Drug, and Cosmetic Act. It put in place a number of important protections for patients, including requirements for getting informed consent from people participating in clinical trials and the reporting of adverse events to the FDA. The most important part of the legislation, however, was the requirement that drug companies provide proof that their drugs were not just safe but that they were also effective. This requirement elicited a great deal of teeth gnashing and complaints from the pharmaceutical industry at the time. However, pharma company CEO’s were greatly relieved that price regulation, which was the initial target of the legislation, was not included in the final version. If you like reading about the behind the scenes sausage-making of Federal legislation, I refer you to The Real Voice, Richard Harris’s detailed 1964 account of how this healthcare legislation was enacted. Once again a biomedical tragedy played a very significant role in the drafting of these regulations. In this case it was the thalidomide disaster, in which women taking a drug early in their pregnancies to help alleviate morning sickness gave birth to deformed babies with seal-like appendages. It turns out that the drug was highly teratogenic (i.e. it causes serious birth defects), and was (eventually) pulled off the market worldwide. While the drug was never sold in the U.S., there were numerous victims here because doctors liberally supplied samples to patients before the drug was ultimately denied approval by the FDA. This story has been extensively covered; check out Dark Remedy: The Impact Of Thalidomide And Its Revival As A Vital Medicine by Trent Stephens and Rock Brynner. People put an increasingly high value on healthcare, and they live much longer than they used to. For example, life expectancy for men in the U.S. in 1917 was 48, by 1967 it had reached 67 years, and in 2017 it reached 76 years. Those are a lot more years for people to consume medicines, and costs are concentrated in the final few years of life. Medicines, unlike virtually every other product, are one of the few things that you literally cannot live without. There have been tremendous advances in the fields of genetics, molecular biology, medicinal chemistry, pharmacology, immunology, and pharmaceutical science. Much of this was enabled by powerful technologies, including DNA sequencing and synthesis, CT, NMR, and PET scans, blazing fast computers, electron microscopes, and surgical robots. There have been numerous pharmaceutical innovations over the past century. Major discoveries include vaccines and antibiotics for tackling infectious diseases, and drugs to successfully treat a number of illnesses including diabetes, high blood pressure, multiple sclerosis, cancer, and many others. Effective treatments replaced ones that were either ineffective, or only helped manage symptoms, but did not target underlying diseases. The introduction of private health insurance starting in the 1930’s made it possible for patients to afford the costs of these medical treatments once they became widely available. Americans, through the high prices they pay for drugs, subsidize much lower prices in virtually every other country across the globe. Consolidation. This effect cuts across all industries, but is especially prominent in the pharmaceutical industry. 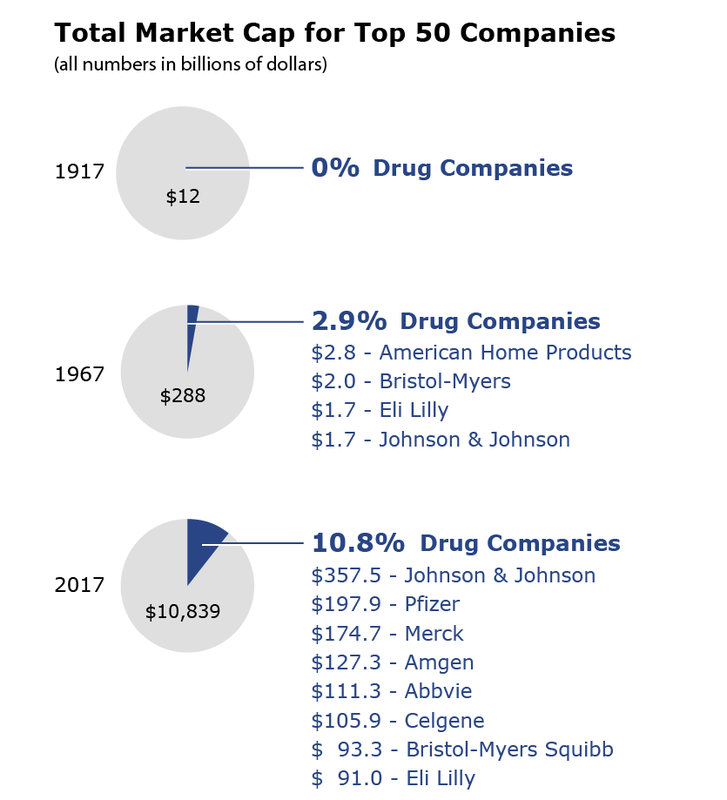 Check out this article to get a flavor for what’s occurred in the past fifty years in terms of pharmaceutical mergers within and between countries. Note also the decline in corporate tax rates since the early 1960’s (set to decline further by nearly half in 2018). Laws and regulations passed over the past century have greatly increased the cost of entry into the pharmaceuticals business. They serve as effective barriers to competitors entering the market. Like robotics, there are four key laws we can point to that enabled the industry to thrive. These are the Pure Food and Drugs Act of 1906 (prevented misbranded and adulterated drugs), the Federal Food, Drug, and Cosmetic Act of 1938 (required demonstrating that a drug was safe before it could be marketed), and the Kefauver-Harris Amendment of 1962 (companies had to provide proof that their drugs were actually effective). It is this Amendment that was the key piece of legislation that enabled the industry to grow and thrive, even though passage of the amendment was fought tooth and nail by the industry and their lobbyists. Showing that a drug is pure and what it claims to be on the package label is a relatively easy hurdle to clear. So is demonstrating that a drug is safe if you don’t have to show that it provides a real benefit. Having to prove that your drug is effective, however, is actually rather difficult (and is the leading reason 90 percent of drugs in clinical trials fail). The Kefauver-Harris legislation eliminated many of the posers and pretenders from the industry, allowing the remaining companies to thrive. The Bayh-Dole Act of 1980 created a valuable resource by providing access to innovative discoveries made at the nation’s universities. It gave drug companies a new source for promising drug leads and is now the primary source for biomedical advances (e.g. CAR-T and CRISPR/cas9). Finally, there was the Orphan Drug Act of 1983, which made it financially worthwhile for drug companies to develop medicines for diseases that have very few patients. These drugs are among the most expensive medicines in the world. Biogen’s Spinraza (nusinersen), used to treat spinal muscular atrophy, costs about $750,000 for just the first year of treatment. Lobbying by drug companies to back industry-friendly legislation has been very effective over the years. Spending on this at both the state and local levels reached $57 million in 2017. Monopolies, patents, and price inelasticity allow drug companies to often charge whatever they want for their products with no fear of competitors. Prices are not tied to value, and various strategies are used to keep prices high over decades. There are few industries where a company can successfully respond to declining sales by actually raising the price of their products. Furthermore, the introduction of a competing product frequently has no effect on the pricing of the first drug on the market. Customers don’t order the products (doctors do) and frequently they don’t pay for it as well (that’s what insurance companies are for). Drug companies manage to confound the basic laws of economics all the time. Direct-to-consumer marketing of prescription drugs in the U.S. has driven sales up big time. If it didn’t increase sales the companies wouldn’t be doing this. The only other country that allows this type of marketing is New Zealand. Worldwide markets for many drugs (and other goods) have expanded greatly over the years, although people in poorer countries don’t have affordable access to many of the most expensive drugs. Strong capital markets, including ready access to venture capital and angel investors to start new companies. Growth of an outstanding educational system, including many of the world’s top research universities and medical centers. No doubt the winds of change are blowing throughout biopharma, and, as Bob Dylan put it, “a hard rain’s a-gonna fall.” Change is coming, and not all organizations will survive in their present forms. The largest tech firms are moving into the healthcare space at rapid pace, investing billions of dollars in 2017. They see the potential of using technology to help solve problems both small and large. How this will all shake out will be an interesting story to follow in the next decade. Biopharma is only one part (making up 15 to 20 percent of the cost) of our healthcare system, and I have a hard time believing that its problems are insolvable. The needs of people are simply too great. New economic models for how biopharma companies operate and are paid are needed. Those who have been gorging themselves for decades at the healthcare profit trough will likely have to cut back on their bloated intake of dollars. After all, the primary reason that healthcare in the U.S. is more expensive than other countries is prices, not utilization. Advances like the availability of recombinant proteins and monoclonal antibodies revolutionized the pharmaceuticals industry. We are now in the process of ushering in a new era of cellular and gene therapies, both of which are also likely to have profound effects on human health. In the end, entrepreneurial spirit, coupled with innovative thinking, will move us forward. Like life itself, progress, “uh, finds a way”.